360 Fashion Network at GMIC Beijing, China. Tomorrow, the 360Fashion Network team will be stationed at our booth at GMIC 2013. We will be proudly demonstrating our award-winning app – Vero Moda at “AppAttack”. 北京，中国 – 360时尚网络发布了诺基亚Lumia 920上面的VERO MODA移动应用，该App适用于Windows Phone 7 & 8。软件里面充满了各种符合女性购习惯的贴心功能，是一款真正的由女性为女性设计的追逐时尚潮流的软件。“试穿”功能让用户能够计算整套搭配的价格，并且可以直接购买这套搭配。通过诺基亚地图的支持，用户可以找到附近的零售店，在店内或得促销活动的推送信息，还可以通过“拾色器”工具对VERO MODA零售店里面的商品和用户衣橱里面已有的服装进行搭配. 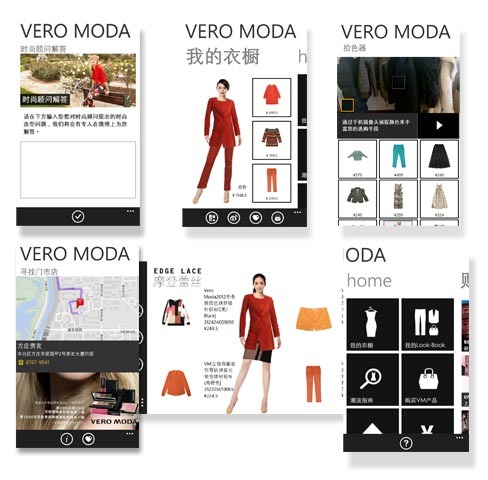 Vero Moda is a true fashion oriented app, developed by 360Fashion Network for Nokia Lumia 920. 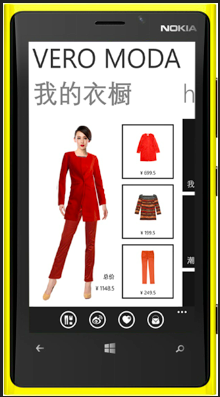 This award winning app is topped with features for China’s modern white-collar females. Vero Moda delivers a new creative way of virtual shopping experience. It’s like no other browse-and-pay app, Vero moda features a “Fitting Room” where the user can mix-and-match; by using the “color picker”feature, a Vero Moda user can even create a personal shopping look book according to the color preferred. Vero Moda App is a one-stop app for mobile e-commerce, it is a fully-packaged app for retail branding and marketing promotion tool in its most creative and inter-active execution.